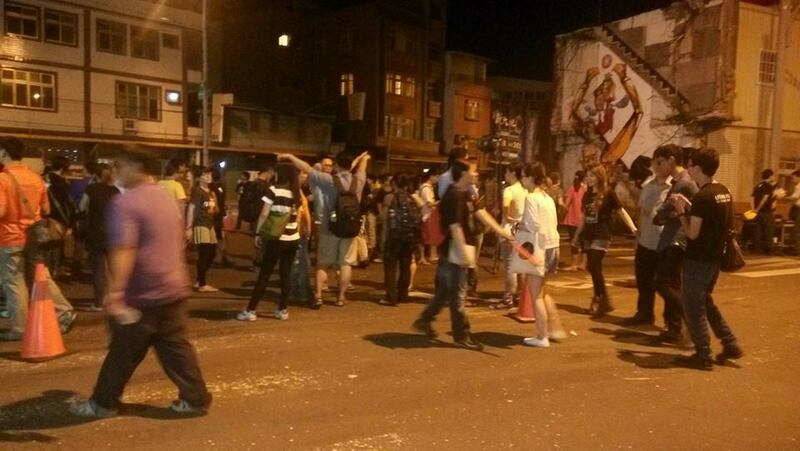 Civil Revolt in Miaoli County? 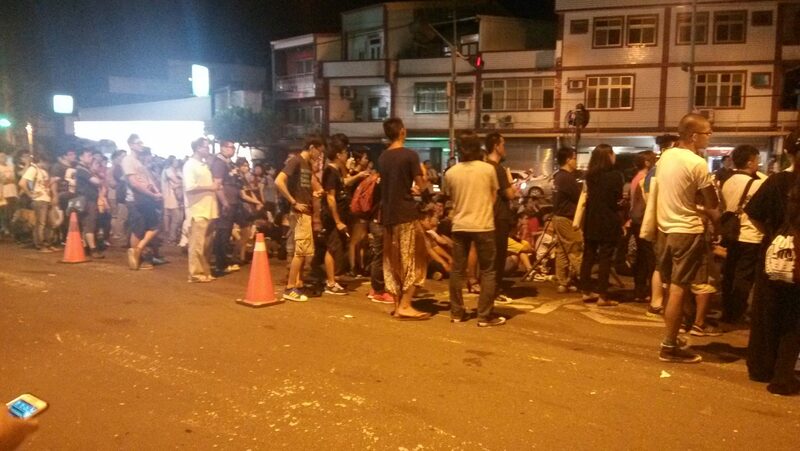 THIS PAST FRIDAY, approximately 200 protestors gathered outside of the former site of Chang Pharmacy in Dapu, Miaoli. One year ago on July 18th, 2013, the family-owned pharmacy was forcibly demolished in order to make way for commercial development. In September, owner Chang Sen-wen (張森文) was found dead under a bridge. The death was ruled a suicide by police, but there are those who remain suspicious, including Chang’s son. 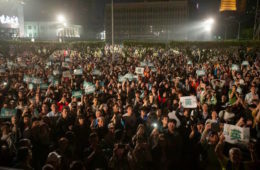 For the last few years, Miaoli, specifically Zhunan township, has been a site of resistance against a prospective science park, which is part of the government’s broader plan to develop the rural area, The protests was marked by high participation of student activists intent on preventing the forcible housing eviction of Miaoli residences; at one point, teams of student activists camped out and monitored the area for incoming construction crews or police. Some have pointed to the role of anti-eviction actions in forming the networks and structures behind the Sunflower movement’s impressive ability to coordinate. 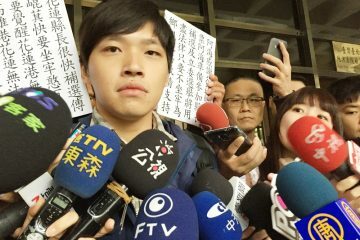 Chen Wei-Ting, one of the two prominent spokesmen of the Black Island Youth Front which coordinated the Sunflower Movement’s Legislative Yuan occupation, notably rose to prominence after throwing a shoe at Miaoli County Commissioner Liu Cheng-hung (劉政鴻) in September of last year. Just last Friday, Chen was found guilty by the Miaoli District Court and fined NT $10,000. Nevertheless, the issue of evictions is a long standing one which extends far beyond the demolition of the Chang Pharmacy. 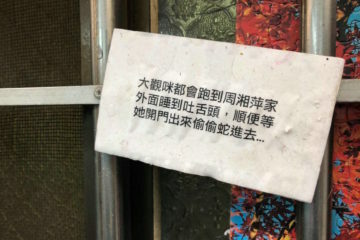 Residents of Dapu, Miaoli have faced the threat of eviction for several years before the involvement of student activists. Indeed, originally twenty-four homes in the village of Dapu in Zhunan township were scheduled to be demolished, but pending negotiations with the local government overseen by then-Premier Wu Den-yih (吳敦義) in 2010, twenty out of the twenty-four homes were allocated farmland as reparation for loss of land. The Ministry of the Interior later overturned this decision, and outrage over Wu’s broken promises ensued. The issue has not yet been resolved, as litigation continues. Notwithstanding these unresolved legal proceedings, the remaining four homes, including the Chang Pharmacy, were, demolished on July 18th last year in order to make way for the science park. Greater Taichung High Court would later rule the forced demolitions illegal, though the families were denied still reparations. 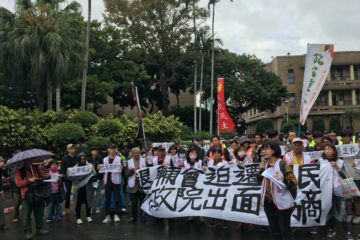 As protestors said several times during the July 18 rally, Chang Sen-Wen is no longer among the living, so it is not as though reparations cannot repair certain things at this point. 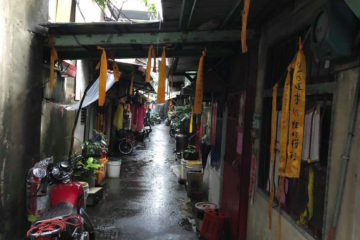 Nonetheless, Chang is, in fact, not the only casualty, seeing as the matriarch of the Chu family also among the four households facing eviction killed herself in 2011. 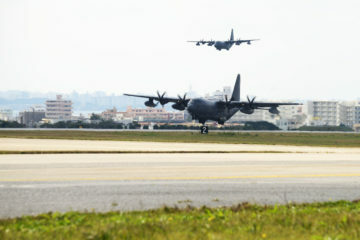 What made Miaoli remarkable was the amount of students willing to travel from metropolitan areas to the rural locale of Miaoli to participate in actions. Far closer to home for many students, similar events transpired. 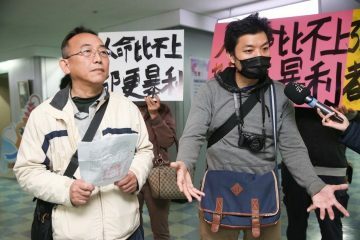 Le Young Construction LTD last year evicted the Wang family which had been living in two two-story apartment buildings in the Shilin district of Taipei for over a decade. Their home was demolished on March 28th, 2012. Backed by student supporters, the Wang family thereafter attempted to occupy a prefabricated container unit on the site of their demolished home and to fight out their case in court but in act of apparent desperation, family member Wang Yao-Te (王耀德) brought a demolition team in to destroy their container unit on March 14th of this year. 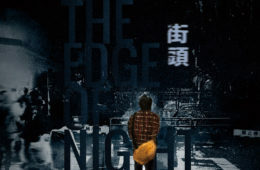 While family member Wang Kuang-Shu (王廣樹), Yao-Te’s father, then vowed to continue the fight, citing exhaustion, the Wang family thereafter settled with Le Young on May 27th. The Wang family had been the only family out of 36 that had refused to settle with the Le Young Construction LTD’s Wenlin Yuan apartment complex construction project. 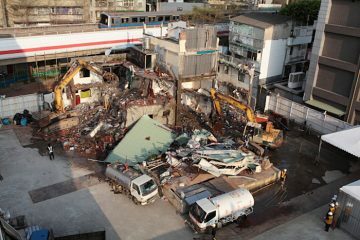 Of course, there are other examples, even in Taipei; for example, the demolition of homes in the Huaguang community of lower-class Mainlander Taiwanese unfortunate enough to live on land that has become highly coveted luxury real estate in recent years. 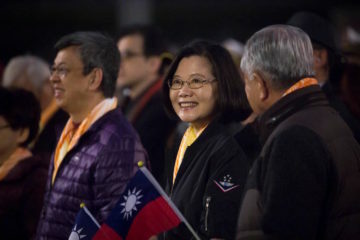 Miaoli is merely the highest profile example and the Wang family the most recent example. So the problem persists. 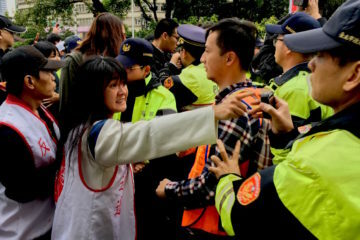 Not many in the media have made the connection between the recent protests against tree removal in the Songshan area of Taipei with the Wang family and Miaoli housing evictions. 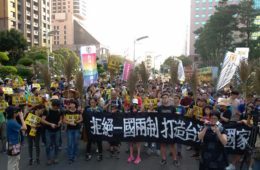 In fact, it strikes the author that Anglophone commentators have been loathe to comment upon the strangeness of the fact that Taiwanese civic society was up in arms over the removal of trees. 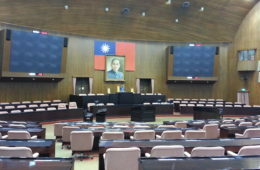 What would appear to be a remarkably small issue in other parts of the world has somehow enraptured civil society at large in Taiwan. But, of course, the issue at hand is not merely the preservation of trees, but the wanton demolition of what is local in order to realize schemes of unrestrained drive towards commercial development and the willingness of the forces driving commercial development to use force and violence, often enforced by gangsters, to accomplish their means. As such, what would just pass by in another society becomes a highly politically charged issue. 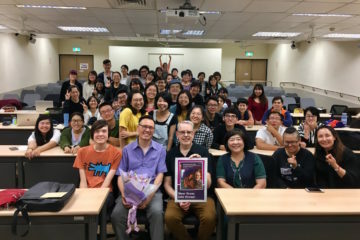 THE AUTHOR, WHO WAS in attendance of the Miaoli protest on Friday and is no stranger to political organizing himself, came away impressed but also critical. Of course, organizing a protest that attracts even just one hundred people is oftentimes something which requires months of hard work. 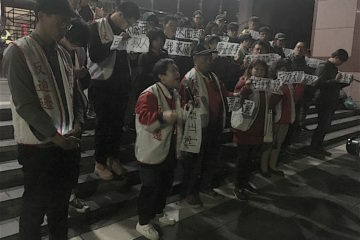 That the demonstration outside of the former site of the Chang Pharmacy attracted not just local residents but people who had to travel for hours to get there is even more impressive. 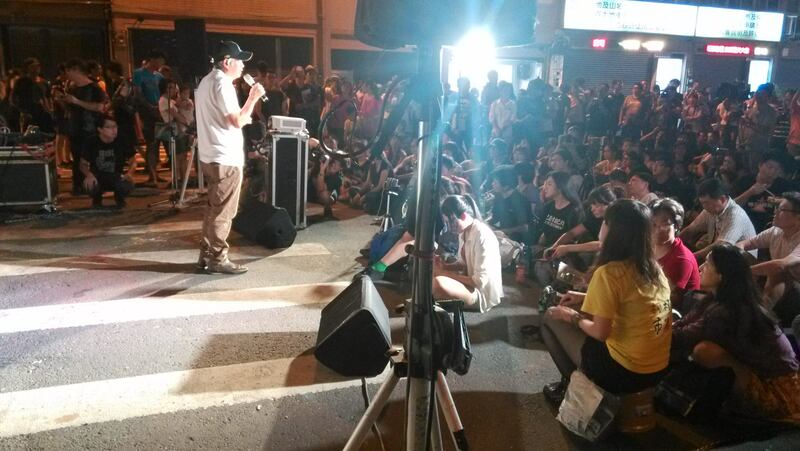 Indeed, a large number of the protestors had had to travel from Taipei to arrive at the site, including many of the usual suspects seen at protests in Taipei, as well as noted activist and Taiwanese New Wave film director, “Super Citizen” Ko I-Cheng (柯一正). But it discomfits the author that only two hundred people showed for the one year anniversary of the Chang Pharmacy demolition. 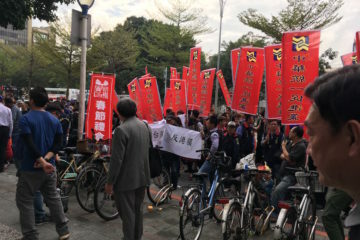 Though the demonstration on the Saturday a week after the Chang Pharmacy demolition only attracted three hundred people as well, one might judge this most recent gathering in comparison to the demonstration on August 16, 2013 in which over one thousand gathered to throw eggs at the Miaoli County Government Building. 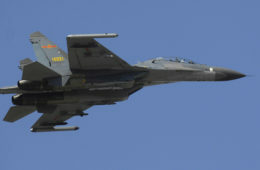 And while the Wang family incident in March 2013 is a fresh wound, much remains to be done. 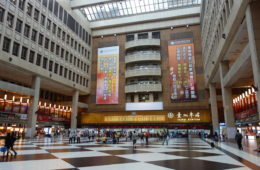 This includes targeting the root of the problem of evictions: the contemporary Urban Renewal Act (都市更新條例), which is the legal justification for the seizure of private properties by corporations for legal development. Similarly, a broader based effort to target the corrupt legislators which provide for the legal backing of construction, urban development, and real estate corporations behind the eviction of home residents is also required. 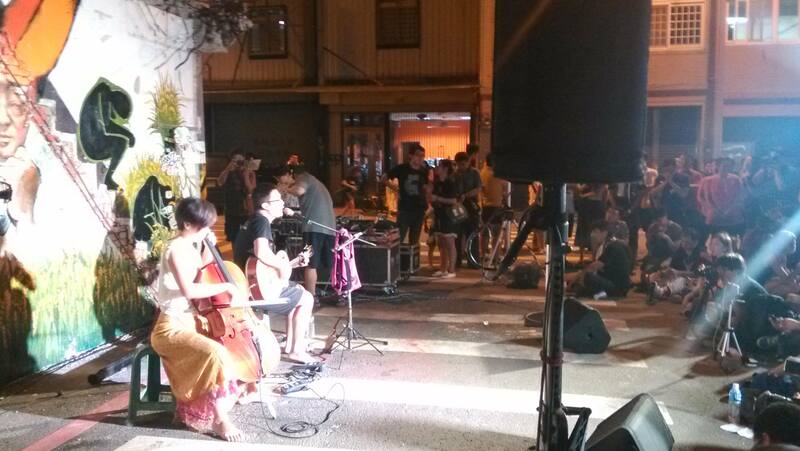 The protest at the former site of the Chang Pharmacy bespoke the intimate relation of art and politics in Taiwanese social activism. 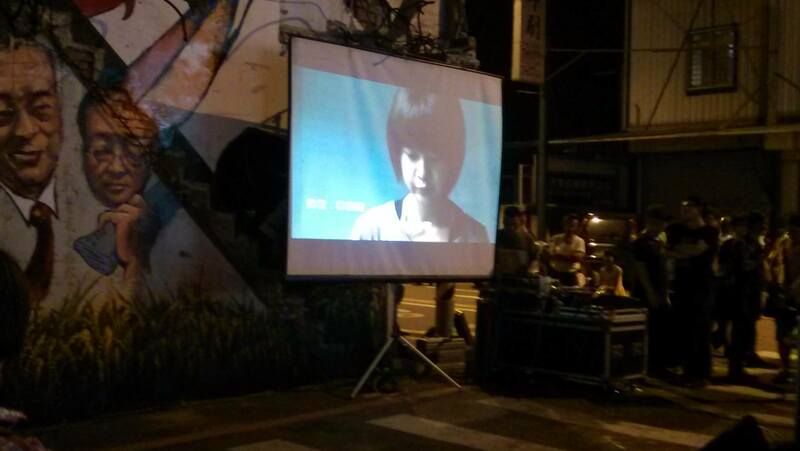 Apart from the fact that a number of high-profile Taiwanese independent artists were on site, the centerpiece of the protest was the mural that had been painted by Liu Tsung-gung (劉宗榮), and the protest featured the screening of an Tanztheater-like interpretive dance film by Hsiao Tzu-han (蕭紫菡) as well as a variety of skilled and impressive musical performances. Yet though there has the number of Taiwanese artists participating in social movements through the central role of social issues in their artwork is remarkable. 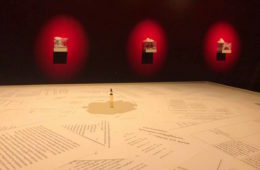 The synthesis of art and politics in Taiwan is remarkable even in comparison to oft-cited coinciding points of art and politics as Occupy Wall Street, yet one speculates as to the aestheticization of social movements. What is demanded in the present is the resolution of concrete political issues as the Urban Renewal Act. 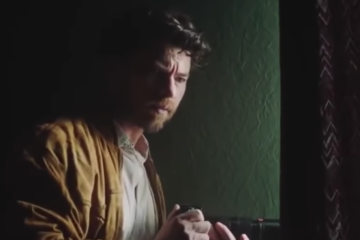 Though a protest in commemoration of an incident can serve as a reminder that an issue is far from resolved, such a protest can only point to how much more is demanded to resolve an issue than just commemoration of a past event, however artistic or otherwise. There is much to be hopeful of. For one, there is the support of local residents, and the intangible bond of solidarity which exists between those who have a stake in the issue of housing evictions. After the protest, while walking back to the train station, the author was picked up by a driver who realized that he had come from the from protest and offered him a ride. She was, in fact, far from the only driver to slow down while approaching the author as though considering whether to give him a ride or to see what his reaction would be. 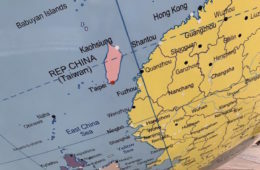 But, more than that, there is the fact that the issue has not died away in the mind of the socially conscious across Taiwan—that is precisely, that this is not just only a local issue but a national one and remains so. While two hundred in attendance could, of course, demand more attendees, the issue is still at hand, and necessitates the deliberation of concrete measures in order to resolve it. Storming the Legislature a Second Time?